Due to Hurricane Michael’s visit to NC, registration for our new Fall Education date is open for Fall Conference 2018 at Caraway Conference Center in Sophia, NC! Click here to proceed to the conference registration page. Click here for a downloadable flyer of the event to print, post or share. The conference facilitator is Chaplain Stephen B Roberts, BCC, Past President of the Neshama Association of Jewish Chaplains with service on the Board for almost a decade. Responding to the 9/11 terror attacks, he was the first Spiritual Care Officer overseeing the provision of Spiritual Care through national American Red Cross’s Spiritual Care Aviation Incident Response Team in New York City and then helped oversee the program as the Senior Volunteer from December 2001-May 2002. Rabbi Roberts is a Founder and Chairman Emeritus of Disaster Chaplaincy Services. Over the last decade, Rabbi Roberts has worked very closely with the leadership of the Association of Professional Chaplains, National Association of Catholic Chaplains, the Association of Clinical Pastoral Education, American Association of Pastoral Counselors, Canadian Association for Spiritual Care, and other groups on a variety of critical chaplaincy leadership projects. Rabbi Roberts was part of helping to create The Spiritual Care Collaborative; co-overseeing and co-guiding the process leading to the Common Standards for Professional Chaplaincy, Common Code of Ethics for Chaplains, Pastoral Counselors, Pastoral Educators and Students; and participating in the approval of The White Paper. Rabbi Roberts presently serves as leader of the Temple of the High Country, Boone, NC. He also functions as an Adjunct Chaplain with Watauga Valley Medical Center. A total of 4.25 contact hours will be offered. Registrations accepted through September 28. Late or cancelled registrations will incur a fee. Please note that NCCA conferences are held at retreat centers, so please be prepared to bring along necessary toiletries or personal items. Spiritual care has a wonderful history of cultures and religions that build communities’ sense of support and meaning. 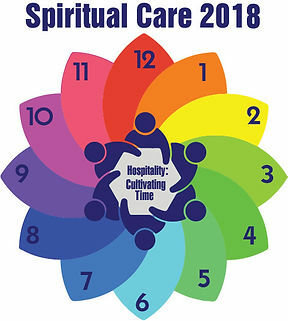 This year’s theme continues the emphasis on hospitality with a focus on cultivating time. The welcoming and belonging associated with hospitality require time that is treated as precious in developing relationships. This nurturing of connections requires an attitude of listening and appreciation. For those involved in the task-oriented dimensions of health and support, there is a temptation to achieve the quantitative dimensions of the profession and miss the depth of relationships that requires time. Time allows the cared-for to express the real problem, the deeper implications and the meaning or despair that is felt at a soulful level. Cultivating and nurturing time is a challenge in an age of instantaneous communication and multiple sources of connection. Human presence flows back and forth – it takes time for mutuality and trust to develop. Cultivating time conveys to the recipient a treasuring of them as a person no matter what they are going through. We hope that this year you might appreciate even more the time taken in spiritual care which conveys preciousness and healing at every stage of life. Each year a new theme brings to the light a certain aspect of pastoral care as a focus. A new theme invites us to new and creative ways to tell the story of pastoral care. At the annual meeting of the North Carolina Chaplains’ Association in May of 2018, Janice Wakefield was approved by the membership as an Emeritus Member. This award includes the honor of free membership and meeting attendance. Janice has been a member of NCCA for approximately 35 years. She served the group as “Archivist” from 1984 to 1986. During this time she wrote a history of the organization. She served as Treasurer 1986 to 1988. From there she move to the presidency of NCCA in 1988 to 1990. Janice and Janet Forrest presented a program for the spring meeting a number of years ago. Janice believes it was called Nuts and Bolts of Building a Palliative Care Program. Janice did her first unit of CPE during seminary at what was known then as Louisville General Hospital. Her residence was done at what is now Wake Forest Baptist Medical Center. Her first job after her residency was at Wesley Long Hospital. She served there for 12 years. She served as a Clinical Chaplain at High Point Regional Medical Center for the remainder of her career and retired earlier this year. Congratulations to Janice on her successful career as chaplain and thanks for her service to NCCA. The Spring Conference of the North Carolina Chaplain’s Association (NCCA) was held on Lake Norman at Camp Dogwood, Sherrills Ford, NC on Wednesday, May 2 to Friday May 4, 2018. It was great to see so many friends and to have a chance to catch up with what is going on in their lives. The meeting began Wednesday evening with a pre-conference session by Melanie Childers on navigating the board certification process. This was an opportunity for more support and guidance for those working on their certification. The alternative was a pre-conference fellowship with refreshments and board games. Chaplain Bob Riley reported that he enjoyed this unstructured time for fellowship with friends and the opportunity to create new relationships. The conference began on Thursday with a centering time presented by Chaplain Anita Harvin of Gaston Hospice. This was followed by three sessions on Keeping Pace with the Changing Culture. The presenter Ralph (R.J.) Gore, Jr. D.Min, Ph.D. is a retired Army Chaplain, a veteran of Operation Iraqi Freedom, a Professor of Systematic Theology and Ministry at Erskine Theological Seminary and Dean at Trinity College and Erskine Seminary. On Friday morning, Chaplain Gore presented a very thought provoking case study. We were challenged to see how what we learned could be applied. This resulted in a rich discussion by the group with many expressing their own opinions and feelings. Consequently, this carried over into a post conference executive meeting where we were discussed the need to create a safe place for discussion for all NCCA members who come from many different backgrounds. The business meeting was held between sessions on Thursday with President Cynthia Vaughan presiding. The continuation of the NCCA Journal Club was announced by Sara Stratton and Terri Vilagos, Co-Chairs. The Journal Club meets bi-monthly by Skype or phone. Greg McClain was introduced as President for the next two years. The Awards Banquet on Thursday night was a highlight of the conference. Attendees enjoyed the ambiance of beautifully decorated tables in the dining room. Each centerpiece reminded us of our “higher calling”. Chaplain Walt Windley (Hospice and Palliative Care, Charlotte Region) led the group in a trivia game that encouraged teams to work together for answers. Congratulations to Cynthia Vaughan who retired from New Hanover Regional Medical Center in Wilmington in 2017. Congratulations to Janice Wakefield, retired from High Point Regional Medical Center, who was honored as an Emeritus Member of the NCCA. During the meeting the Communications Committee offered a survey to assess the best method of connecting with our membership. For the members present almost 100% use email daily so it seems to indicate that is the preferred method. Other members of the NCCA will be surveyed by another method in the near future. The conference ended on Friday with a Memorial Service. Each person lit a candle in memory of family, friends and colleagues who have died. It was a cathartic time for many and hopefully this facilitated healing. Thanks to all who worked to make this meeting special and to those who participated. We look forward to seeing you at Fall Education Day on October 11, 2018 at Camp Caraway where Chaplain Stephen Roberts will be our speaker. He is focusing on crisis response in both large emergencies and in community crisis. He will include elements of PTSD effects and personal coping as a chaplain who deals with “taking in” the grief and pain of others.